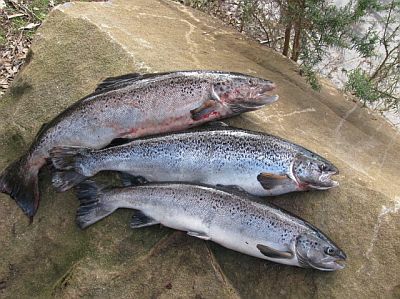 IFS stocked Atlantic salmon to 30 pounds into Brushy Lagoon Thursday 29 May. The 400 Atlantic salmon were donated by Petuna Aquaculture from their Cressy farm averaged five kilograms in weight, with many much bigger. Anglers are reminded that there is a five fish bag limit at Brushy Lagoon with only two permitted to be taken over 600 mm in length. Two proven soft plastics to try are Strike Tiger 2.5" T-Tail Princess and either a Yep black/gold Flapper or split tail Red Rascal. 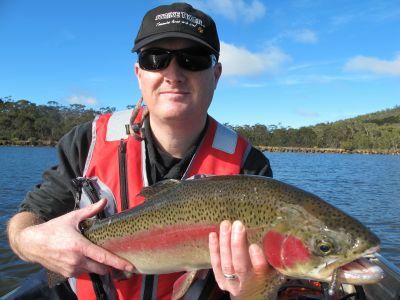 If you haven't checked the IFS website recently, Brushy Lagoon has been stocked in the last week with some good sized rainbow trout and atlantic salmon. We fished the dam wall end this morning in Craig's brand new tinny. We anchored up well clear of the dam wall in a 4 metre deep section of the lagoon. Conditions were calm, but cold. 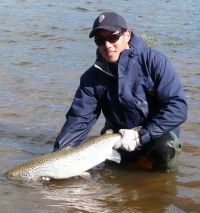 The IFS stocked Brushy Lagoon with 230 Atlantic salmon on the 5 of June. The fish were donated by Petuna Aquaculture and average four kilograms. This will be welcome news for those wishing to chase some big fish over winter. Please remember that there is a five fish daily bag limit with only two fish over 600 mm permitted to be taken. Note that Brushy Lagoon is open from one hour prior to sunrise and closes one hour after sunset (newspaper times for sunrise and sunset). Please note that IFS officers will be actively enforcing the regulations so that everyone can enjoy this opportunity. Late last week (13 September) Brushy Lagoon received 270 salmon at 3kg average and 60 brook trout at 1.5 kg average. 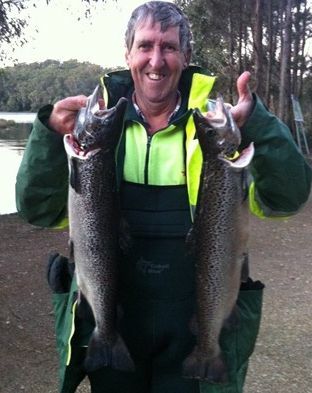 I took Bailey and his mate Jack Shennan for a quick fish to Brushy Lagoon after work. We arrived there around 5pm and the boys flicked some softies around for an hour, Bailey managed to land a nice 6lb salmon,talked to a few other anglers who all had fish. One fellow posed for the camera with a couple of nice salmon he had caught, another fellow was telling me that a couple of anglers caught 26 salmon and kept the lot - talk about bloody cormorants!! I guess my report really starts on Friday at 1pm when I picked up my mate, (Kevin Wilkinson), from the Launceston Airport and took him straight out to Brushy Lagoon in the hope of getting him onto a decent sized Atlantic Salmon. Naturally, I couldn’t get away without my daughter Demi in tow again, especially after her efforts the previous day. I was now delegated to boat driver for the afternoon! We headed to Brushy Lagoon at lunchtime. Patrick landed 2 Atlantic salmon before we even left the boat ramp. Then we fished out of the boat for a couple of hours picking up another four. We loaded up the boat and cooked up a couple snags and Patrick caught another one off the boat ramp. All were between 6 - 7 pound. We then headed to Four Springs for the last couple hours of daylight. Jamie only managed a couple on pumpkinseed. Couldn't catch any on the t-tail. Bill and I decided to go to Brushy Lagoon today just to get a bit of practise ready for the coming season. We headed off at 11am and the weather looked a bit crook but you know what fishermen are like, ignore the bad weather pray. We arrived and was quickly approached by a distraught lady asking us if we had any pointy nosed pliers. I never had any but bill quickly rushed to his tackle box and came to her rescue so he thought.she had a very nice fish in her possession which she said that her son had caught and in getting the hook out it must have entrenched the hook in his finger up to the barb. My eldest daughter Demi has just come off her exams and had a student free day today. I suggested a couple of hours at Brushy and she jumped at it. It's been quite a while since we have been out fishing together, time just gets away.